Complete your sunny kitchen or elegant dining room with the Amish Feather Windsor Dining Chairs. Offering strength and durability, these wood chairs are sculpted and shaped for comfort you can count on. The crown of the chair is supported by lovely spindle work and the seat by slender turned legs. The Windsor is a popular style for restaurants and commercial dining rooms. Be sure to visit our Contract Sales Page for information on having these chairs made for your business. These Windsor chairs are handcrafted using solid wood and are steam bent, featuring a molded seat and tilt back. This design is sturdy, yet lightweight, making it a chair you can enjoy using. 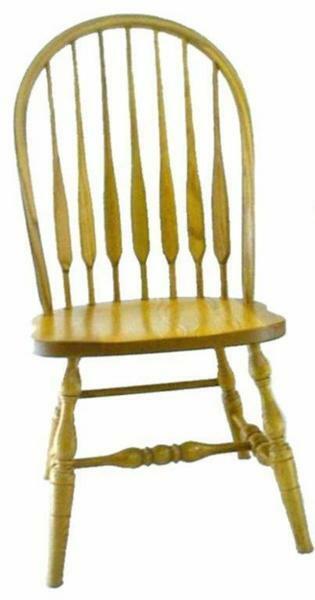 Learn more about Windsor Chairs by visiting the DutchCrafters blog.